It seems I’ve fallen into a pattern of needing a Camino ” fix “every 2 years since I first showed signs of addiction in 2012. This year I’ve decided to walk the ‘ Celtic Camino ‘. 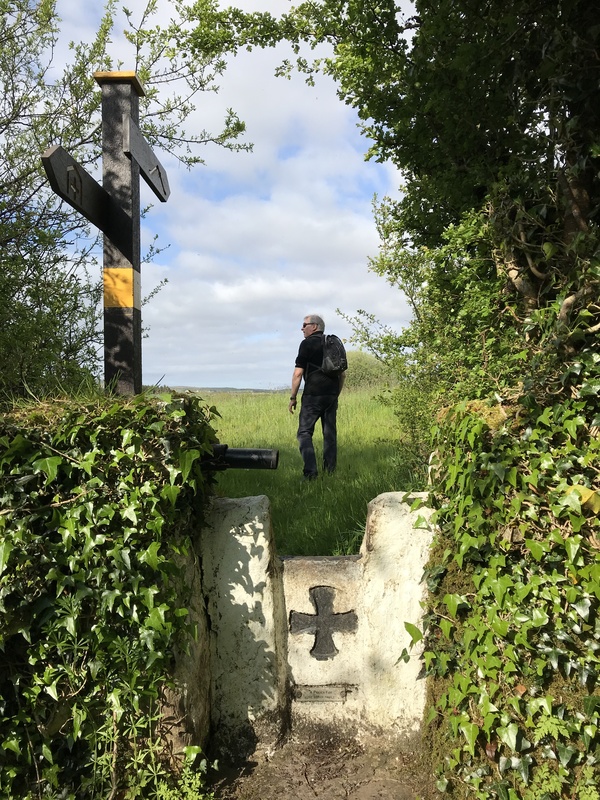 Normally official Camino certificates are given only to walkers who complete at least 100km of the routes in Spain but the Cathedral of Santiago and A Coruña Tourism have agreed that 25km of Irish pilgrim trails can now be included. 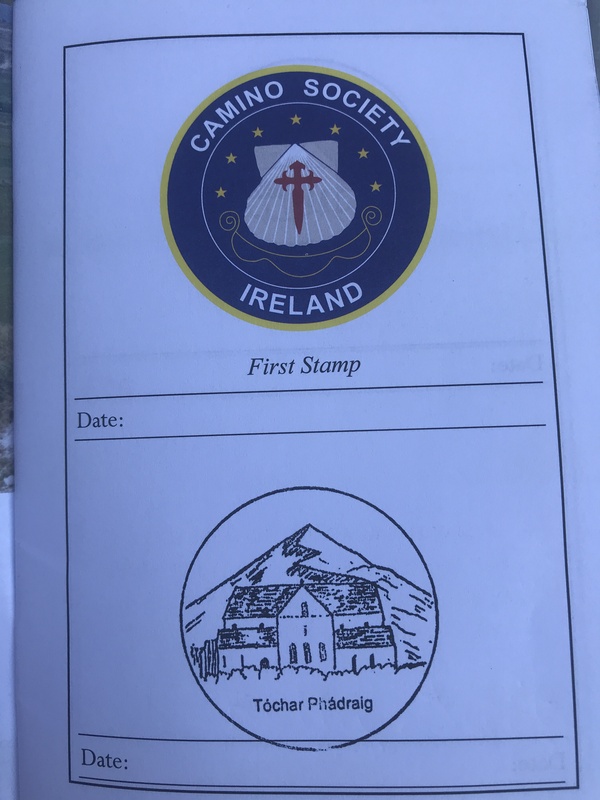 This means that walkers who complete a ‘Celtic Camino‘ – by walking at least 25km of a pilgrim route in Ireland – can collect a special certificate issued by the Camino Society Ireland at St. James’ Church in Dublin. This certificate can be taken to A Coruña in Galicia from where it is a 75 km walk to Santiago de Compostela , ( this route is known as The Camino Ingles ) , allowing you to meet the 100km walking distance requirement to receive the compostela. 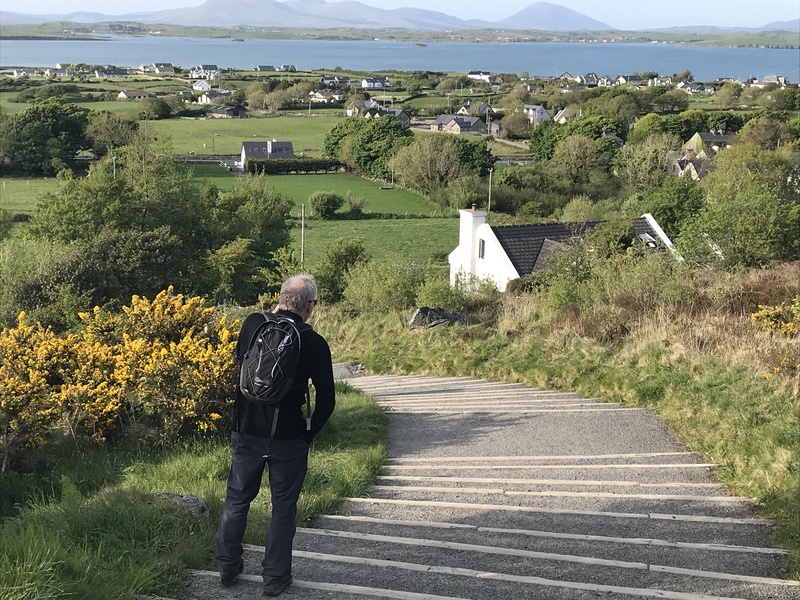 The Camino Society in Ireland have suggested a number of routes including the Tóchair Phádraig ( St Patrick’s Causeway) in County Mayo. 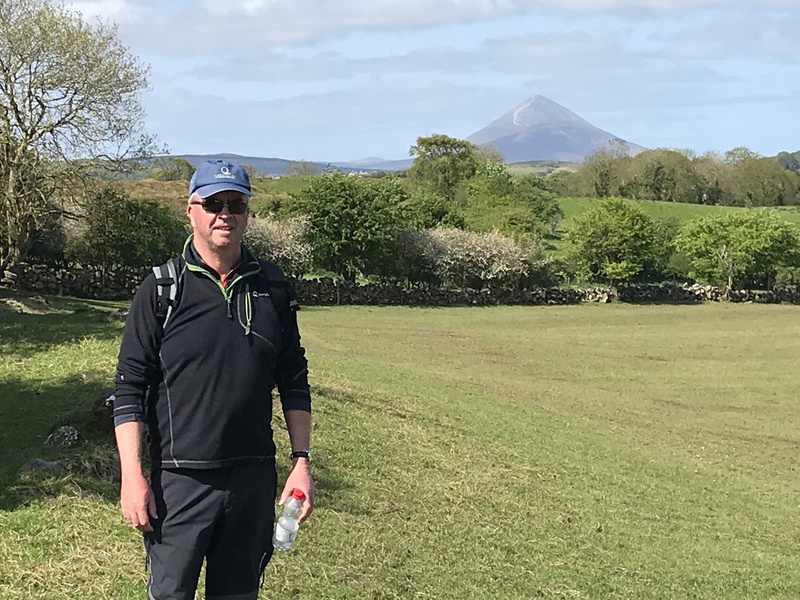 For many years now I’ve spent a week in May in that part of Ireland with a gang of fellow fishing addicts so this year I spied my Camino opportunity and took a day’s break from flogging the loughs to walk the 35km from Ballintubber Abbey to the holy mountain of Croagh Patrick. I chose a day in the week when the weather forecast promised cloudless skies ( conditions not conducive to good fishing ) and I was was joined on the walk by Alan Marsden whilst the rest of the party took the chance to have lunch on Achill Island and visit Keem Strand. 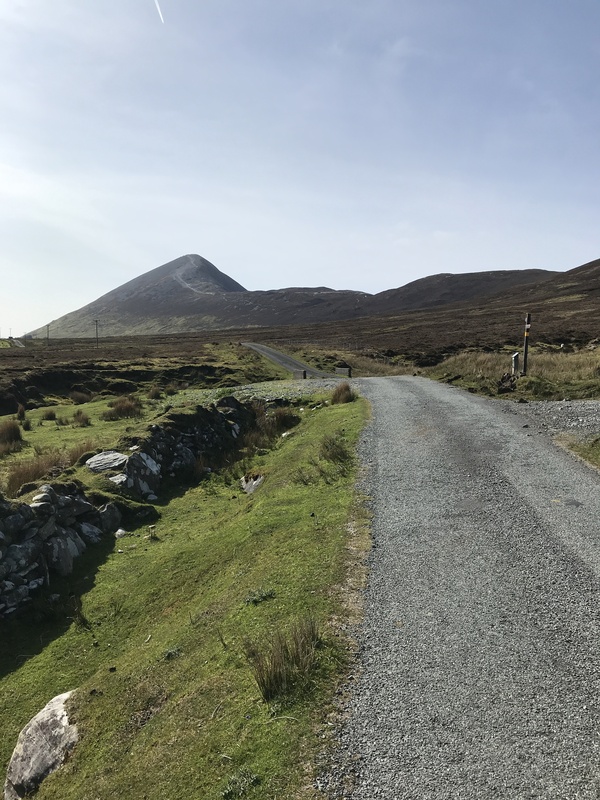 Originally Tóchar Phádraig was the chariot road that went from Rathcruachan, the seat of the Kings and Queens of Connacht ( situated near Tulsk in County Roscommon ), to Aughagower and Cruachan Aigli -Croagh Patrick’s name in Pre-Christian times – translated as the conical mountain of the eagle. After St Patrick’s time pilgrims began to traverse that same road and over time it became known as Tóchar Phádraig or St Patrick’s Causeway. The evening prior to our walk Alan and I drove to Ballintubber Abbey to meet up with Con Lydon and register for the walk ( cost to register is 10 euros ). Con kindly supplied us with a map of the route and stamped my pilgrim passport (order from the Camino Society Ireland for 10 euros ). Ballintubber, from Baile an Tobair, Irish Gaelic for “village of the well,” is named after the well where St Patrick is said to have baptised his converts in the 4th century. Ballintubber Abbey, where the well is located, is the most famous historic site in the area. It was built by Cathal O’Conor, King of Connacht, in 1216. It is the only church in Ireland, still operating, that was founded by an Irish King. The abbey was burned by Normans, seized by James I and suppressed by Henry VIII. The nave roof was burned down by Cromwell’s soldiers in 1653 and not fully restored until 1966, but the apse was the site of services for hundreds of years. The son of the famous pirate queen Grace O’Malley, Tiobóid na Long (the 1st Viscount of Mayo), is buried in a vault in the ruined cloister. It has become a very popular wedding venue , Pearce Brosnan being the most famous name to choose the abbey for his nuptials. 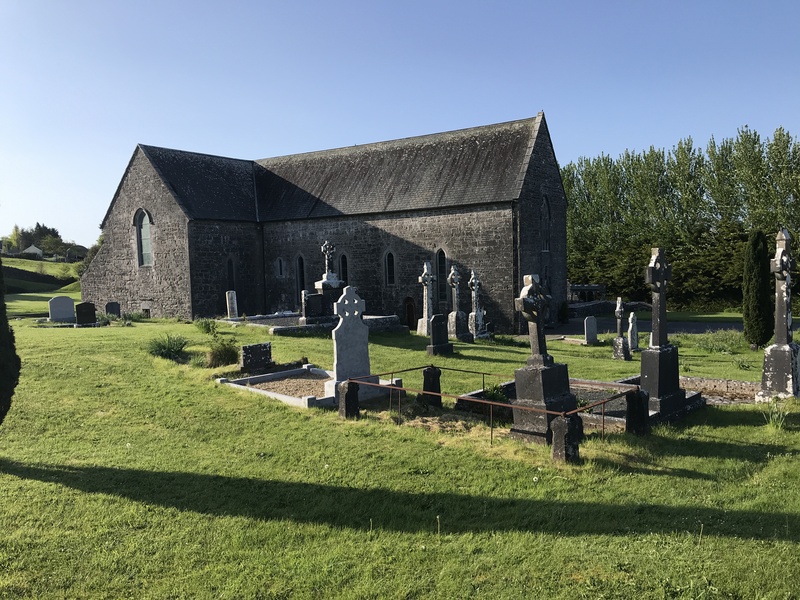 Alan and I arrived at the abbey to start the walk at 8.15am on May 16th where we bumped into the Parish Priest , Father Frank Fahey, who took pains to remind us about the various elements of pilgrimage , with particular focus on the ” no complaining ” rule . 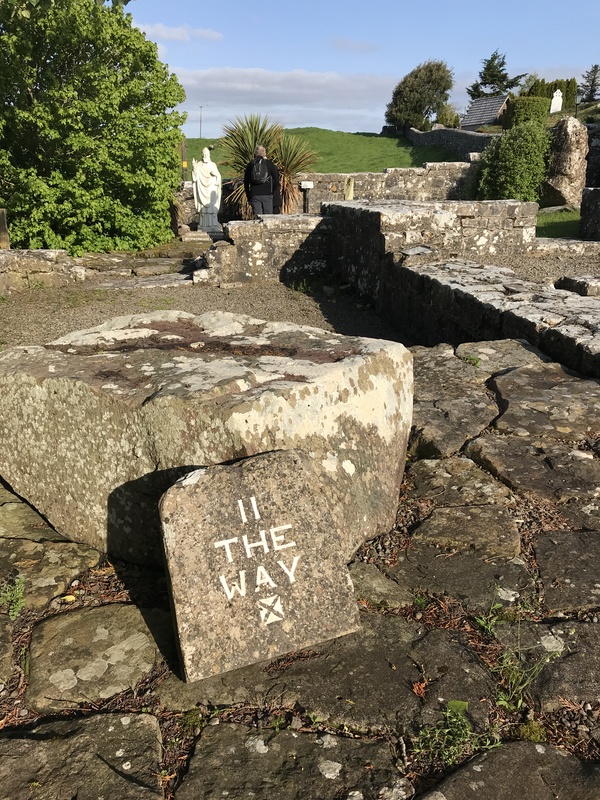 Father Frank was a driving force in the re-opening the pilgrimage route in 1987 after agreements were made with local landowners to give pilgrims rights of way. Here is a video of him speaking about the history of the abbey and the Tóchair Phádraig (part of it shows the interior of the abbey ). 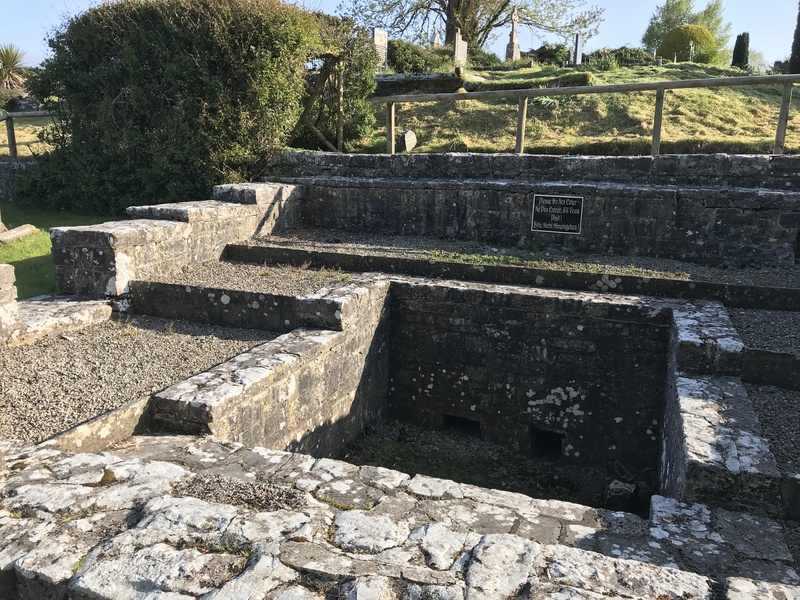 Father Frank showed us the ” Dancora ” ( bath of the righteous ) where the medieval pilgrims washed themselves, ritually expressing a cleansing from their sin (having undertaken the Pilgrimage to Croagh Patrick) as they were about to return to their homes with a “change of heart”. 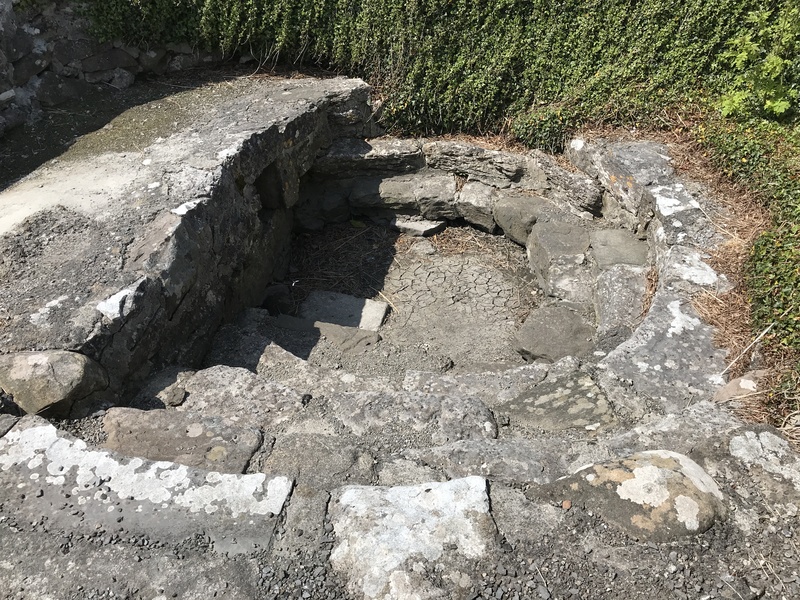 The water in the Dancora was kept warm by placing hot stones in it. The first part of the route took us through an undulating landscape of meadows , ridges and some boggy terrain. All along the route there are signs indicating the direction both to Croagh Patrick and the Abbey , as well as many specially created styles bearing the sign of the cross. 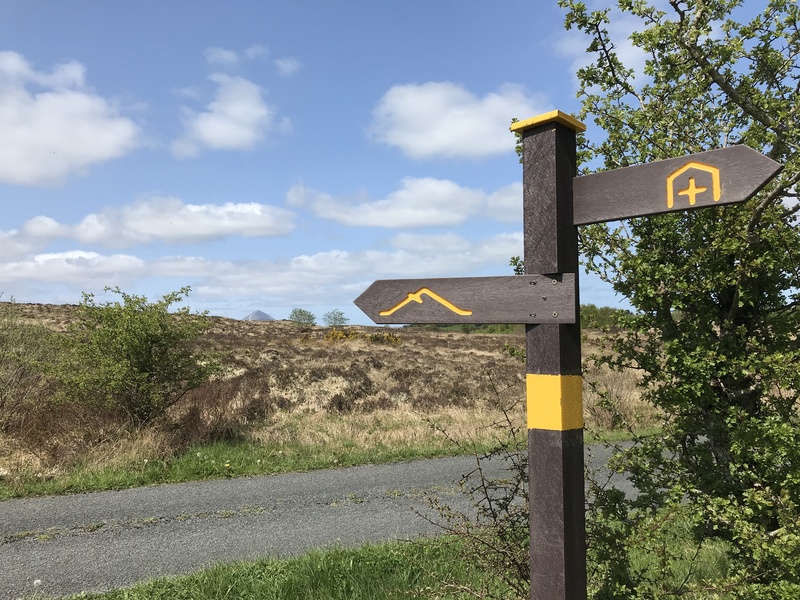 Occasionally we couldn’t immediately see the next signpost or style and had to do a bit of wandering to find them but for much of the route Croagh Patrick is visible in the distance so if you’re walking towards it you know you can’t be far off track. 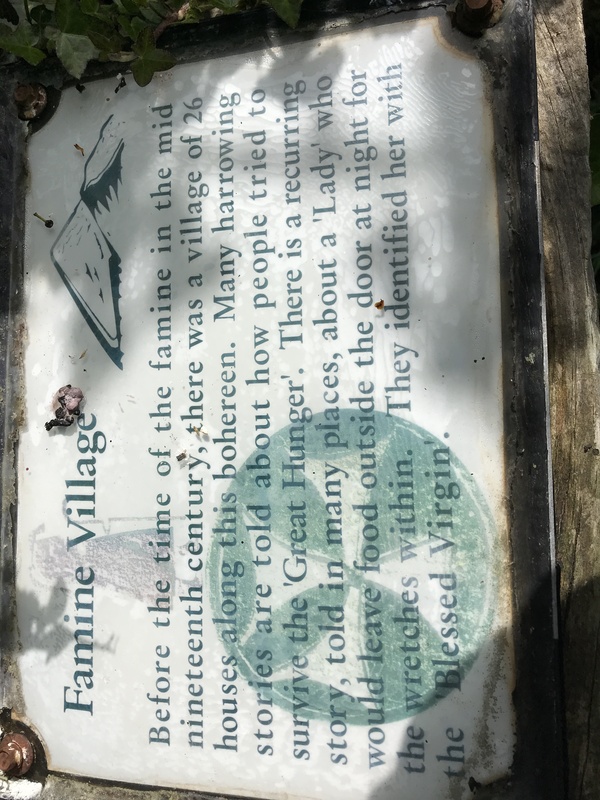 Every so often there is a plaque detailing some history about the locality. 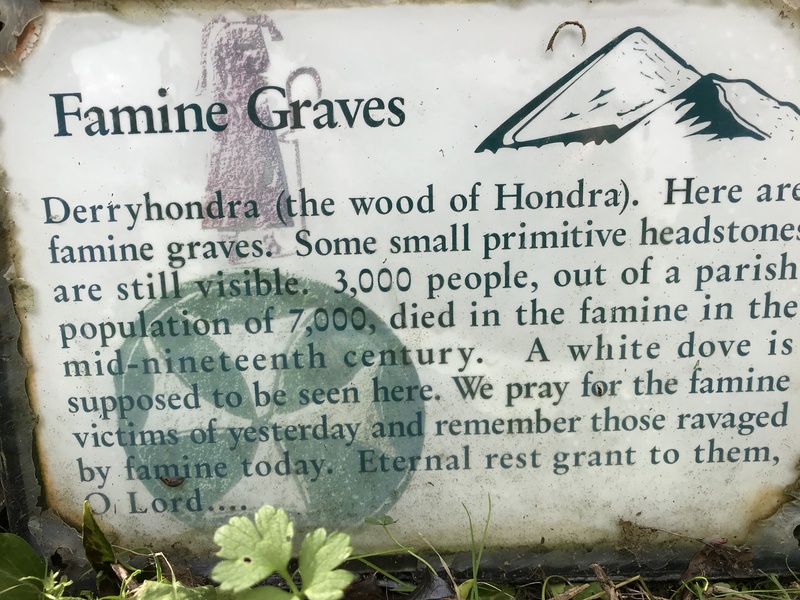 This whole area was devastated by the famine and many of the plaques tell of the villages that were wiped out as a consequence. 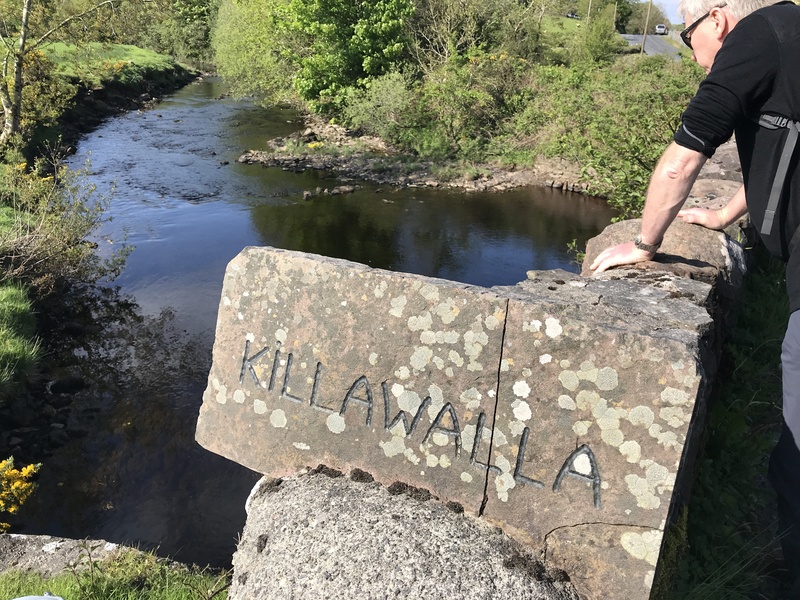 We walked through the small village of Killawalla , stopping to see if we could see any trout in the pools beneath the bridge over the River Aille. Not long afterwards we caught our first glimpse of Croagh Patrick before eventually reaching the attractive village of Aughagower , the half way point of the walk. In the village we pulled into Scott’s Bar and Grocery for a very welcome pint of Guinness and a sandwich. There was a lot of Liverpool FC paraphernalia decorating the walls of the bar and it turned out that the landlord was a big fan. He told us he was going to Kiev via Instanbul to watch the Champions League final even though he didn’t have a ticket for the game but had every confidence he would be able to buy a ticket on the black market once he arrived in the city. 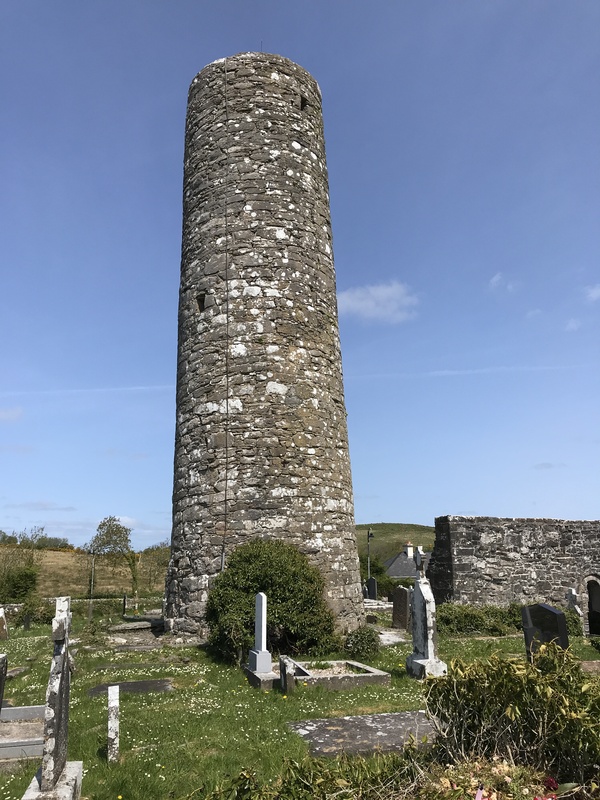 Life is much less complicated if you’re a fan of Blackburn Rovers ……..
Aughagower is dominated by a striking , well preserved 10th Century round tower. Just over the road from the tower is the Leaba Phadraig ( Patrick’s Bed ), where St. Patrick is reputed to have slept before he made his journey across the fields to Croagh Patrick. Pilgrims performed stations between the bed and the nearby holy well, Tobair na nDeachan ( The Well of The Deacons ). 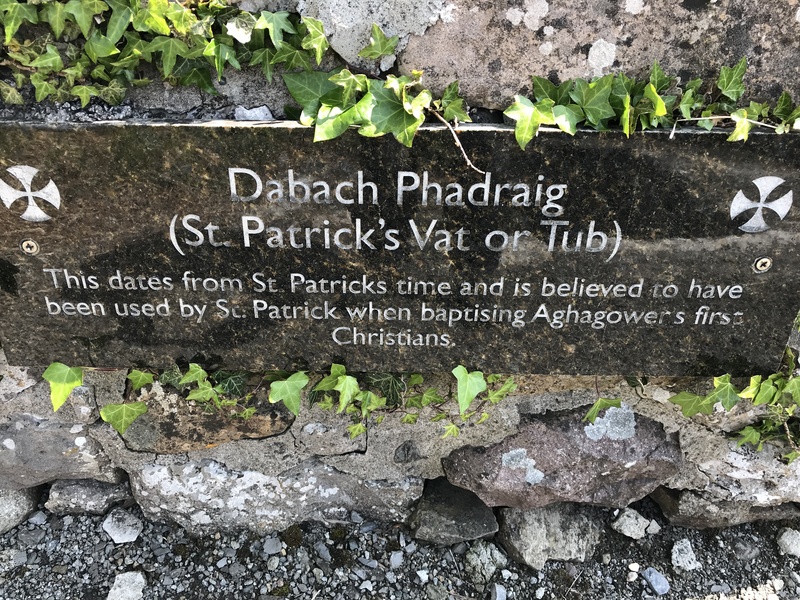 Near to the church is Dabach Phadraig, St. Patrick’s Vat, where he is said to have baptised Aughagower’s first Christians. 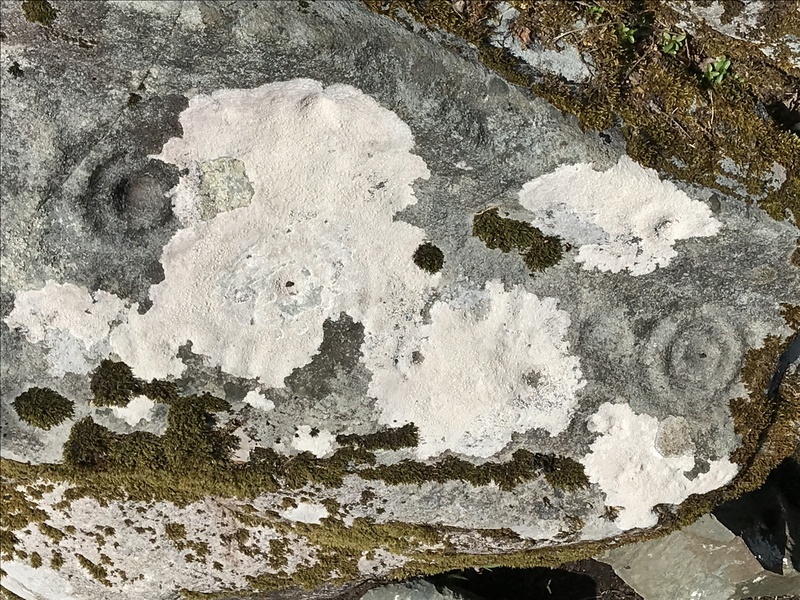 A few kilometres past Aughagower we arrived at the site of the remarkable Boheh Stone , one of the finest examples of neolithic rock art in Ireland and Britain. The stone is situated just off the route down a narrow side road and , at first glance , just looks like a clump of stones hidden away behind a derelict house. It is covered in cup and ring marks , thought to have been carved around 3,800 BC. A connection between the stone, the mountain and the setting sun was first noticed in 1991 by Gerry Bracken , a local historian. 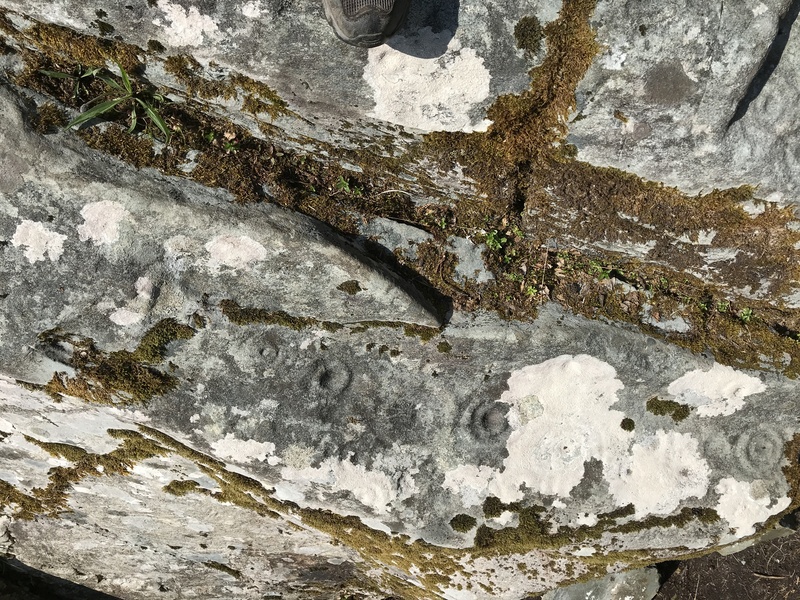 He discovered that on two dates in the year , April 18th and August 24th , the sun sets on the peak of Croagh Patrick and then appears to ” roll ” down it’s Northern slope when viewed from the Boheh Stone. It is thought that the dates signify the beginning and end of the growing season. August is also the month of Lughnasa, the Celtic harvest festival. 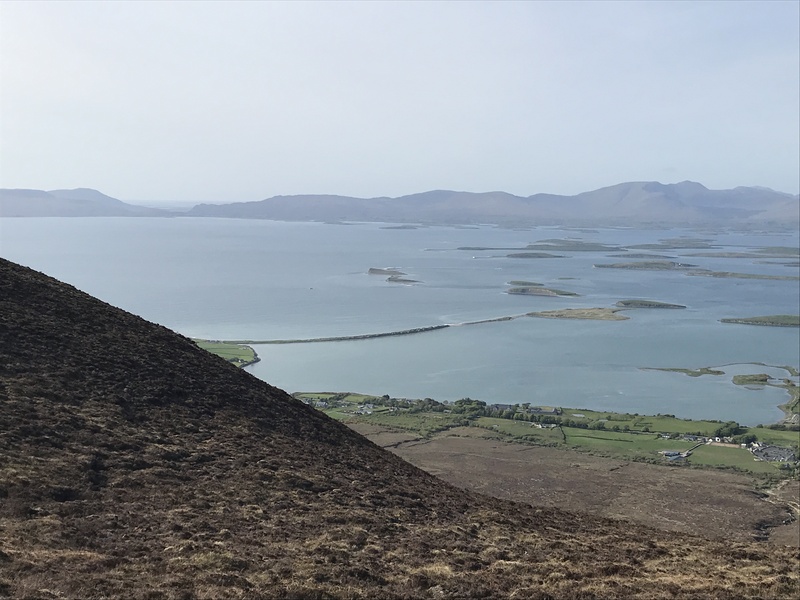 Lughnasa was Christianized, along with many other Celtic traditions and festivals, and the modern day equivalent is the annual pilgrimage to the top of Croagh Patrick on the last Sunday of July every year. The route after Aughagower includes some lengthy on-road sections but these were quiet with very little traffic. The imposing , pyramidal Croagh Patrick becoming ever closer , we crossed the Owenwee River following which the terrain became increasingly rocky and boggy . We then reached a tiny road skirting the southern slope where the landscape is magnificently wild and empty. At this point we could see Lough Nacorra in the distance. When he had ended his fast on the summit Patrick is said to have thrown a silver bell down the mountain knocking she-demon Corra from the sky and into this lough. Not content with this he then promptly banished all the snakes in Ireland into the sea. It is thought that the snakes were seen as symbol of the druids, the high priests of the pre-Christian world. In driving out the snakes, St Patrick was driving out the druids and in doing do, emphasising the triumph of Christianity over paganism. 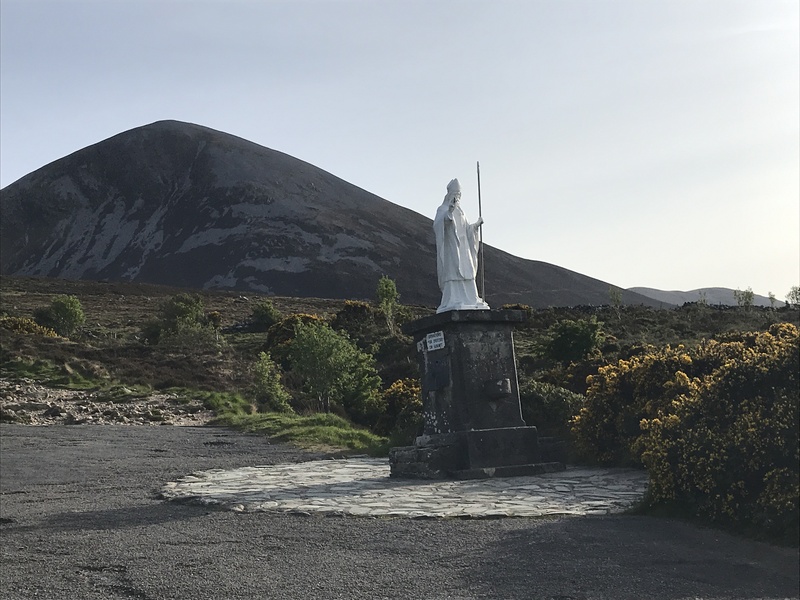 The story of Patrick’s fast of 40 days and 40 nights on the summit of Croagh Patrick is detailed in the 8th C Book of Armagh which is held in the library of Trinity College Dublin. Passing the Mayo Mountain rescue huts we then left the road and climbed steeply up the south face before eventually reaching the main pilgrim path. Half way up the climb I was in grave danger of breaking the pilgrim ” no complaining rule ” as I was breathless , very tired and had lost most of the feeling from the waist down.. Hardier souls than us would have continued on to the summit but we’d been walking for 10 hours by this stage and the thought of a post-pilgrimage pint of Guinness in Campbell’s pub in Murrisk was foremost in our minds. 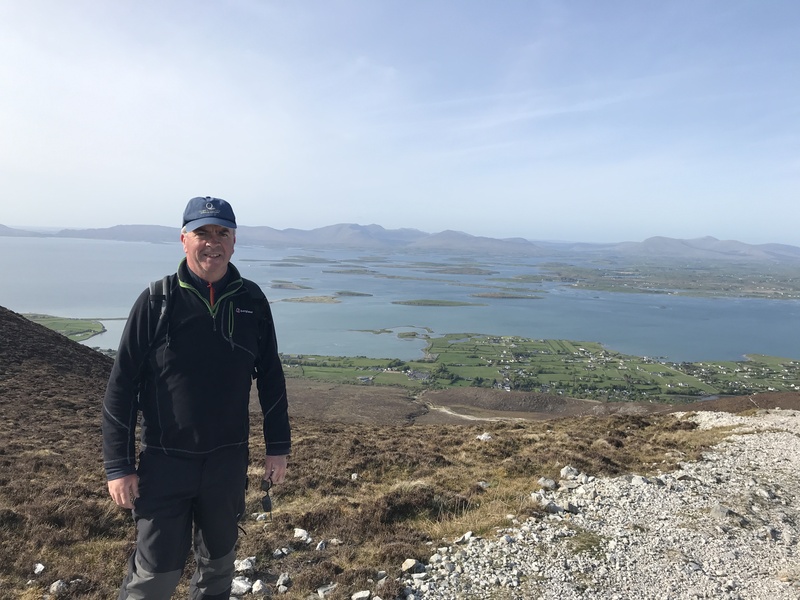 On such a beautiful day there was a stream of walkers both ascending and descending and the views of Clew Bay were magnificent. Legend has it that Clew Bay has 365 islands in it , one of which ( Dorinish ) was purchased by John Lennon in 1967. We descended the well worn path down to Murrisk , stopping at the statue of St Patrick where I said a prayer for my knee joints. 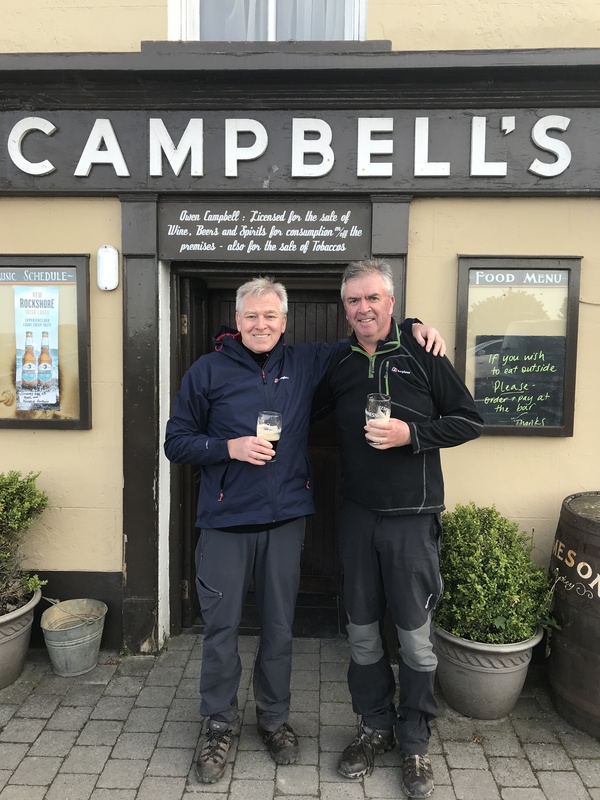 We finally arrived at Campbell’s pub in Murrisk at 7.00pm , nearly 11 hours after we had set out from Ballintubber Abbey. Whilst trying to avoid frothing at the mouth two pints of Guinness were slowly poured and I had my pilgrim passport stamped by the landlady. 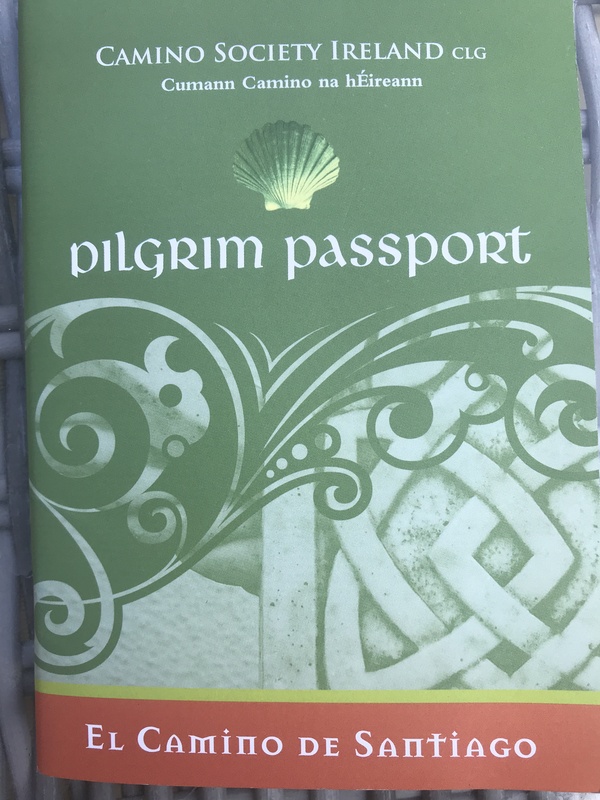 I will now need to send this to the office of the Celtic Camino Society in Dublin who will then forward the “Celtic Camino Compostela” , the certificate I need to take to A Coruna in Galicia for the next stage of this Camino. So that completes the first stage of the ” Celtic Camino “. 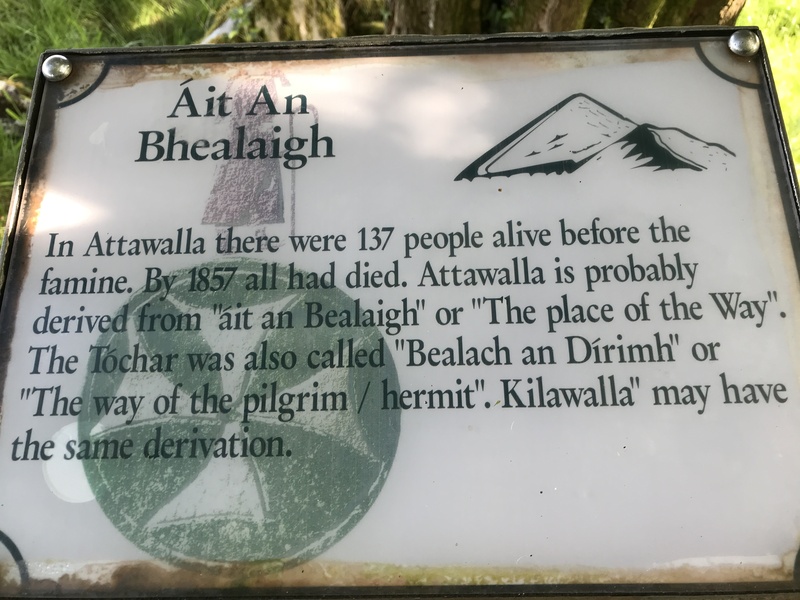 If you wanted to be kinder to your knees and feet you would split the Tóchair Phádraig into two stages , possibly stopping at a B&B in or around the halfway point at Aughagower. 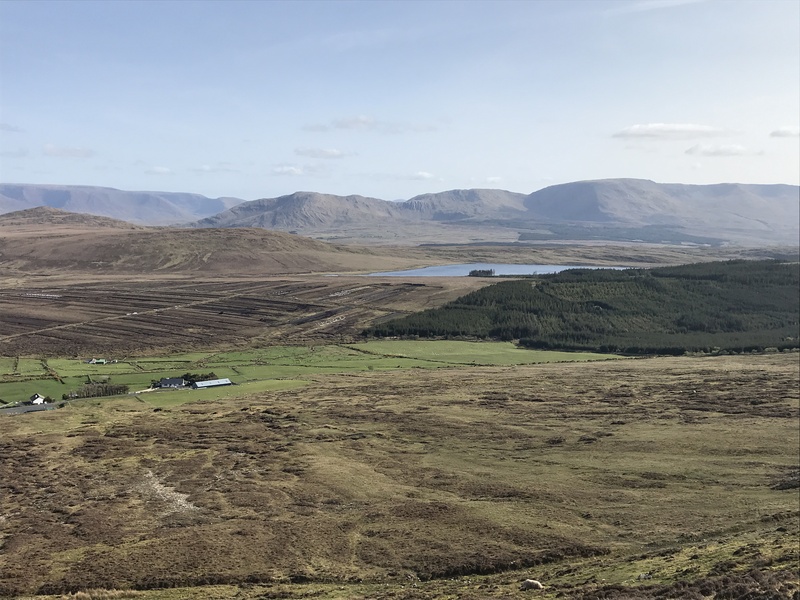 We were lucky to have great weather for the walk and it was a hugely enjoyable ramble across a very beautiful part of Ireland , with lots of historical interest along the way. To be continued from A Coruna in Galicia later this year…..